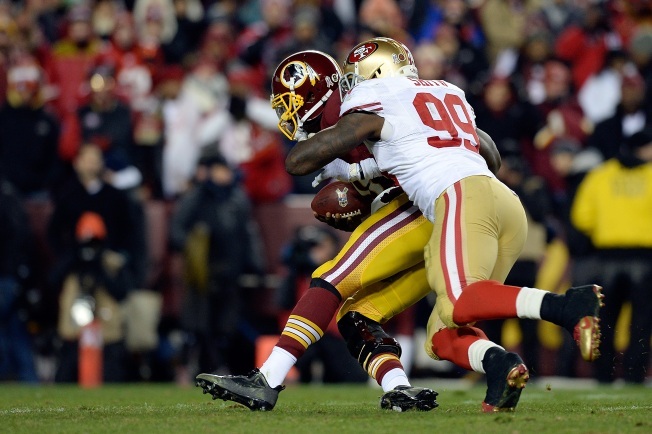 Back in December, NFL analyst Greg Cosell saw the 49ers as a team that had lost its way. En route to an 8-8 season, the 49ers were struggling in the running game, on defense and with an inconsistent quarterback in Colin Kaepernick. Now, after an offseason in which several key players have left and a new coaching staff is in place, Cosell again is looking closely at a new-look version of the Niners. Cosell, the senior producer for NFL Films, recently watched several 49ers practices – and came away with a different view than many, who believe the 49ers are in for another disappointing season. He pointed to the return of inside linebacker NaVorro Bowman, the addition of defensive lineman Darnell Dockett, Aldon Smith’s superb conditioning, an improvement by Kaepernick and Jim Tomsula’s coaching staff as reasons for optimism. Plus, he believes tight end Vernon Davis – a forgotten piece of the offense in 2014 – will be rediscovered. Cosell noted that the 49ers missed Smith’s pass-rush presence in 2014 when he first was suspended and then came back without ever finding his rhythm. Though the 49ers have lost Vic Fangio -- a very successful defensive coordinator under Jim Harbaugh – Cosell believes the new defensive staff under coordinator Eric Mangini can get the most out of the talent on hand. Many Raiders fans might disagree with Cosell on his assessment of Tarver's success in Oakland, yet his overall point about the ability of Mangini and his staff could be solid. It could be a much more aggressive, blitzing and gambling defense under "Mangenius" than it was under Fangio. And if players such as Smith and Bowman are at their peak again, the unit could indeed be much better than some are predicting.